Having heard such great things about the Tangle Teezer, I knew I had to try one. My hair is so thick and, as it's curly, it gets tangled really easy. Apparently this tool removes tangles easily, without any damage, so it sounded like the answer to all my prayers. As luck would have it, my Secret Santa gift from Natalie was this pink and purple Tangle Teezer so I finally got to try it out and see what all the hype was about. Holding the Tangle Teezer is really easy because, even though it's small, it's designed to fit perfectly into the palm of your hand. This does make it a little awkward to reach around towards the back of my head but for the most part, it feels comfortable. Another bonus of this small size is that it's super portable and travel-friendly. With soft bristles of two different lengths, it feels gentle when brushing. However, as my hair is really thick and the bristles are short, I found it doesn't brush through my whole head. This makes it quite ineffective if my hair is dry but, when wet, it's much easier. In fact, the Tangle Teezer makes dealing with my wet hair much less difficult. Of course, using a standard brush can damage hair but a comb is so inflexible that it takes forever to untangle. Using a Tangle Teezer, I can sort out my hair in a fraction of a time but without the usual pulling and tugging that comes with brushing. Because of this more gentle approach to brushing, my hair sheds a lot less than it used to. Of course there are still some loose hairs that wind up coming away with the brush but the design of the Tangle Teezer makes them much easier to clean, so I don't end up with loads of hair twisted around the bristles. All in all, I'm glad to have found a solution to my tangled, wet hair. Although it hasn't quite worked out with dry hair, I do use it every time I wash my hair. I'm glad it's lived up to the hype. Thank you Natalie! Great review!! I've got thick hair and am looking into a new brush. You should definitely try the wet brush. I found the tangle teezer didn't feel like it was brushing all of my thick hair - just the top layer. The wet brush on the other hand is amazing! wet brush all the way! Good to know it lives up to the hype. I have been loving my wet brush, but I might have to grab one of these bad boys too. I have thick hair too and my feelings towards the Tangle Teezer were pretty similar, I ought to dig mine out again soon really! 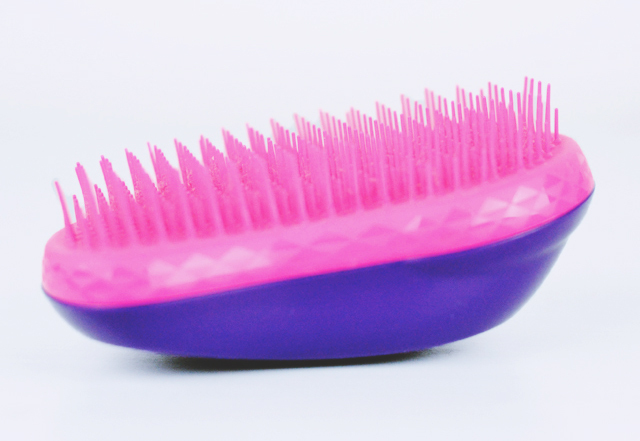 I've used a Tangle Teezer for around four years now and I still prefer them to a normal brush. My hair hardly breaks nowadays!